You are an expat yourself. Why did you decide to set up the company in Mauritius, and what are the advantages and disadvantages? The weather is nice, the beach is beautiful, and I got used to the scuba diving (laughs). When I started to work on Expat-Blog full time, I also invested all my money in the project, so the the low cost of living was one of the biggest upsides. You also pay less tax than in most other countries. The big disadvantages are you feel a little bit like you’re at the end of the world and it’s sometimes hard to find good people. Did you run your site in multiple languages from the beginning? We started in English, French and Spanish. However, our English pages represent 45% of our traffic and 75% of our members. How important are languages for your advertising customers? I believe that brands are often attached to languages, and many customers don’t understand this. For example, when a French bank wants to expand their business to other nationalities, they usually assign the majority of the budget to the French expats, and only use a very limited budget to target English speakers. Then they wonder why the English speakers won’t convert. If you want to expand to a new expat segment, you have to make your brand known among this target group. Otherwise you might as well not bother. How do big brands manage their advertising across different languages? This is a problem when it comes to expat marketing. Most big brands use different national agencies to run campaigns in various languages. Unfortunately, this means that if we’re doing something good in one language we cannot duplicate it in another, because the second language is managed by another agency. Take HSBC for example: we’re working with them in English, but if we want to do the same in French we have to start from scratch with another agency. It would be better if international brands had someone to coordinate campaigns across multiple languages. If this were the case, we could explain what we can do and save them a lot of time and money. Besides branding options, you also have a section of “recommended services” where you create direct leads for customers. Are leads replacing the good old banner campaign? I don’t think so. Many customers still prefer to generate the lead directly on their website, or rather in their system, so they’re not even interested in external leads. It also depends on the product. If you have a product that sells purely online without any direct customer contacts, a pure CPC or CPL model might work. For complex products with physical or individual contacts, it just doesn’t work. Take the customer who walks into a bank office 6 months after seeing your banners–how can you track this? If you would only focus on leads, he wouldn’t know you in the first place. But what if customers are only interested in directly measurable leads? If you want leads, we can create leads for you. To get proper pricing, however, you also need to understand how these leads convert. Unfortunately, we see that many customers have problems measuring lead conversion, especially on external leads. They do not know the quality of the leads, and hence run the risk of paying too much or too little for what they get. Leads are complicated everywhere. Take the hotel market, for example. There are highly sophisticated systems for transferring and measuring leads, and hotels are a fairly simple product compared to many expat services. For expat products I think leads are interesting, but I doubt they will replace the current systems. How can expat marketers choose the right media for selling their services? This really depends on the customer. For big international brands it usually makes sense to work only with the leading global expat sites, as anything else will quickly become too complicated. Small local service providers can use the big sites for targeted campaigns as well. For them, however, it also makes sense to check out the local expat site in the country they are based. Julien Faliu, founder and CEO of Expat-Blog, began his career as an IT Manager and Project Engineer in various countries. 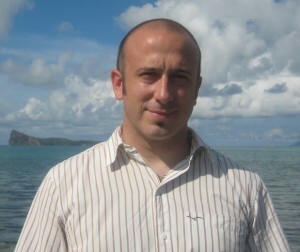 He launched Expat-Blog in 2005 and moved to Mauritius afterward. The company is based there to this day, and the Expat-Blog team has since grown to include 7 people. Posted in Expat Media.Tagged expat brands, expat media, Interview, multilingual websites.